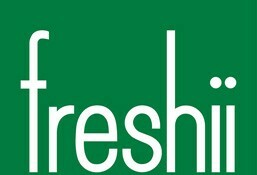 Freshii is currently closed for delivery and it will open at 11:00 AM today . Grilled chicken, edamame, carrots, cucumbers, cilantro, tortilla strips with peanuts on top of spinach n romaine, and shredded cabbage. Served with Asian sesame dressing. Beets, green apples, walnuts, dried cranberries, carrots and goat cheese placed atop freshii mix. Served with honey dijon dressing. Cajun chicken, black beans, avocado, pico de gallo, sweet corn, jack 'n cheddar cheese atop of freshii mix. Served with cilantro lime vinagrette. Grilled chicken, avocado, blue cheese, tomatoes, and corn atop freshii mix 'n romaine. Served with honey dijon dressing. Cajun chicken, brown rice, black beans, corn, tomato, avocado, jack 'n cheddar cheese, salsa and greek yohurt ranch dressing. BBQ chicken, avocado, corn, cucumbers, tomatoes, jack 'n cheddar cheese atop freshii mix 'n romaine, with Greek yogurt ranch dressing and bbq sauce.